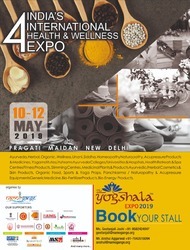 Namo Gange Trust is going to organise the 4th Edition of India's International health & wellness exhibition, 'The Yogshala Expo - 2019' on 10th, 11th & 12th May 2019 at Pragati Maidan, New Delhi. This Exhibition is related to AYUSH Industry ( Ayurveda, Yoga, Unani, Siddha, Homeopathy and Naturopathy). National and International Business Owners Participated in this Exhibition. Book Your Stall and Showcase your AYUSH Industry products.